Plot: All of the kids lined up to play this new video game called the “Wild Side” at the local arcade. It was so special because it used holograms to create new lands to play in. Something went terribly wrong, however. Instead of the kids beating the boss, the boss escaped and beat them! Now the kids are trapped somewhere within this holographic world–all except one. The coolest, most skilled video game player on the block aims to beat this boss and rescue his peers. His name? Kid Chameleon! The story for Kid Chameleon is far’fetched and forgettable, but this is one classic platformer you don’t wanna miss out on. You begin the game as The Kid; he runs and jumps like your standard early 90’s era platformer. By breaking boxes, though, you can obtain masks and transform into uniquely different characters. This might sound a lot like Mario because this was Sega’s response to the platform juggernaut Nintendo had created. 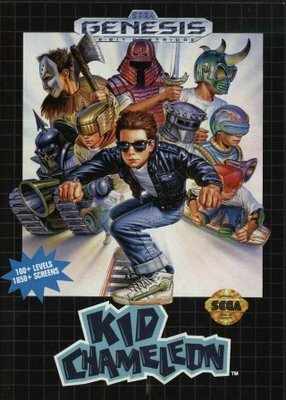 The difference is Kid Chameleon allows you to transform into 9 different forms and has a lot more levels than a Mario game. This could be good or bad depending on your taste. 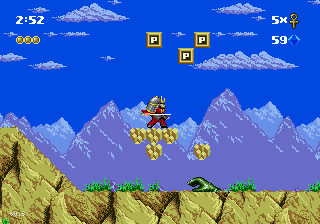 In Kid Chameleon you collect diamonds instead of coins; when you collect enough diamonds you can perform special powers depending on which form you are in. 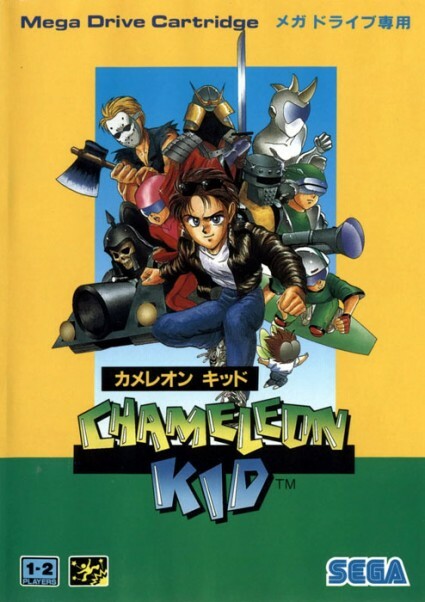 I am in no way saying Kid Chameleon is better than the Mario games, but I feel this game has an array of unique features that set it apart from Mario. Therefore, if you are a classic platformer gaming fan, you need to check this game out. The sole reason I believe this game did not explode in popularity is that it did not have a password system or save feature. With over a hundred levels it is mind-blowing that the creators decided to leave out these features from the game. I have good news though; Kid Chameleon is included in the Sonic’s Ultimate Genesis Collection game that can be bought for the Xbox 360 or PS3, and it has a save feature. Sonic’s UGC was released in 2009 and can probably be bought for around $20 at your local gaming store. That’s pretty much all I gotta say about Kid Chameleon. It is a great platformer with some unique qualities. Plus, it has a lot of depth of enemies and levels to entertain you for hours. Check out the rest of the post for detailed analysis on each of the mask forms The Kid can transform into. Comments: Anytime you lose all your health in another form you turn back into The Kid. Comments: This form can be used to “go Rambo” through a tough area with its high health. The bigger diamond power makes this form even better for it, and the extra hit point stays even when you change to another form. Comments: This versatile form is great for getting through obstacles. Also, formidable at killing enemies since most get hurt from being jumped on. Samurai Haze is the only diamond power that affects bosses. Comments: Beserker is the only form in the game with the ability to instantly kill an enemy. Comments: This form is the most useful for boss fights. You can keep your distance while throwing a volley of axes. Comments: This form is great for unloading an assault on enemies. Skulls drop and bounce off walls allowing this form to shoot and kill enemies on platforms below. Comments: This form is great for avoiding enemies with flight. Certain levels have shortcuts specifically for Cyclone. Occasionally, you can simply fly over levels with no ceiling. Comments: Perfect for exploring the game for hidden extra lives and continues. Eyeclops has a very low diamond power that is a very useful offensive attack. Comments: This form is the best for quickly scaling walls and obstacles. Micromax’s small frame makes him a small target for enemy attacks. Comments: This form is difficult to use, but is the fastest form in the game. If you master the form you can keep flipping in mid air to the point where you are basically flying.